Get a head start on testing planning and execution with automation. Track and collaborate on every testing effort and have immediate insight into all testing activities. Know immediately who tested what, when, and what the result was. Test scenarios automatically generated from requirements are automatically connected so the most common traceability is already established. No guessing, no manual work, and no confusion. Stay in one place to have a full and complete view of all testing activity for a project. Know which test execution activities are surfacing potential issues and which ones are going well. The crucial interaction between testers and resolvers is front and center of every test case execution activity. Every time a test case is executed the workflow is updated for fast and easy testing and resolving collaboration. It’s built in. Submit one, some, or all test scenarios for a project through an engaging and trackable approval process. 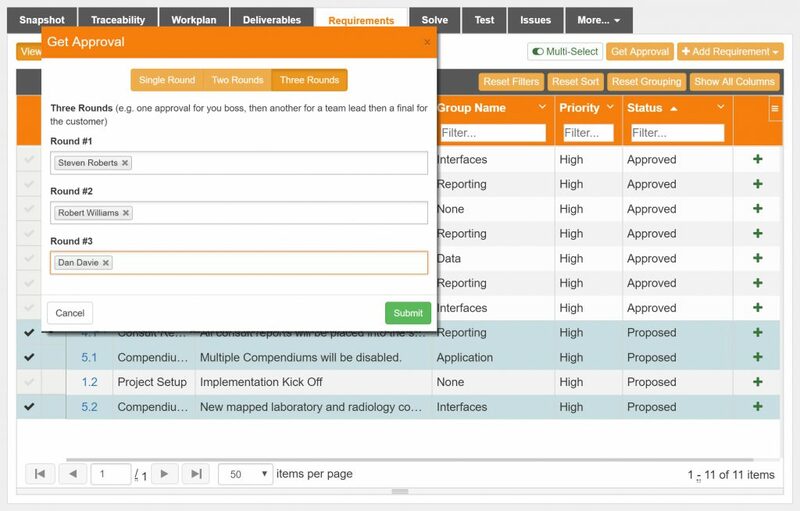 At a single test scenario or approver level, you can see who has responded and who hasn’t, track and respond to questions during the approval process, and separate distinct groups of approvers for multiple levels of approvals.